Miguel Almiron's due back on Tyneside ahead of his first training session as a Newcastle United player. Almiron, signed from Atlanta United in a club-record £21million deal on transfer deadline day last week, has been in Paris to secure a work permit. 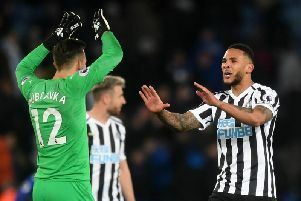 And the 24-year-old Paraguay international, due back in Newcastle later today, is due to train with his new team-mates tomorrow ahead of the February 11 game against Wolverhampton Wanderers. Almiron has been training on his own since the MLS Cup final in early December, and United manager Rafa Benitez is minded to include him in his squad for the televised game at Molineux. "I think he will be fine with the visa and the work permit, and hopefully then he will train with the team," said manager Benitez, who gave his players a few days off after Saturday's 1-0 defeat to Tottenham Hotspur at Wembley.